Luci Barker: Transitioning into Autumn: Autumnal Makeup Look! | Part 2/2. Transitioning into Autumn: Autumnal Makeup Look! | Part 2/2. Autumnal makeup is probably my favourite type of looks to create as I love warm and cozy colours with a vampy twist. I thought for today’s post, that I would share one of the looks that I have created so far this season and I absolutely love how it turned out. 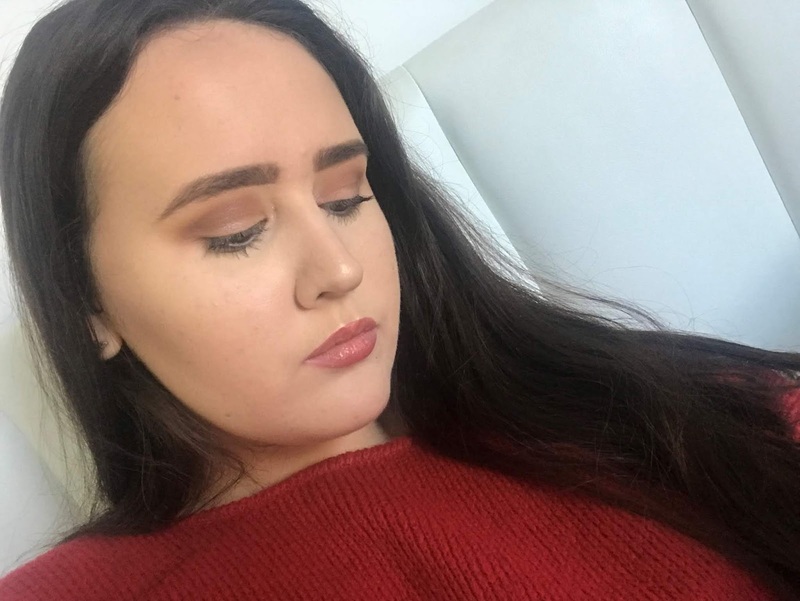 I like to the keep the base quite simple and go all out for the eyes and lip so the products I used on my face include the Maybelline Dream Satin Liquid Foundation, which is actually new to my collection and I have been loving using it as it gives a semi matte finish which I think is perfect for what I want in a foundation, particularly for this time of year. I then use the tiniest bit of the Revolution Conceal & Define Concealer in C3, under my eyes and on my chin. I then take my beauty blender and bake my under eyes with the NYX Banana Powder and apply it to my under eyes, my chin and the centre of my forehead to sort of bake with it. To set the rest of my face I just used a Natural Collection Pressed Powder and then bronzer up my face with my new go-to Benefit Hoola Lite. After bronzing, I take more of the Banana Powder and use it to bake under my bronzer before I contour. I find that using translucent powders can create a white line under the contour but this seems to sharpen the contour without it looking to much of a sudden change in colour. I then take an angled contour brush with the NYX Taupe Blush and contour my nose and cheeks slightly. To highlight, I use the W7 Glowcomotion which is gold toned and is quickly becoming a go-to for this time of year as its super pigmented and glowy ... I’m actually obsessed. For brows I decided to switch it up from my usual bold brows and use a pencil instead which is the Benefit Goof Proof in number 4 and obviously set it with my trusty Natural Collection Clear Mascara. The Imogenation x Revolution Palette has been the palette that I've been reaching for since I bought it, as it is soo versatile meaning I can create lots of different look with it including more natural looks and bold ones too! To start off I took Pinky Promise and Imagine and blended them through the crease as my transition colours. I then took Mills and Sorry not Sorry on the outer corner and blended them through the crease. I then packed Pinky Promise onto my lids and placed Forever Friend on the inner corner. I finished off the eyes with the Soap & Glory Thick and Fast Mascara. I’m always changing my mind about lip colour because there are so many autumnal ones I love, so I did include a few options including Whirl, Flat Out Fabulous, Ruby Woo and Party Line which are all from MAC. But for this look I chose Party Line as I thought it looked best. If you would like to read my favourite fall lip colours post then please click here. And there we have it, the final look ... I really hope you enjoyed this post and I will see you in my next one! New in for October: Beauty Haul! The Knitwear Edit | 2018.